Leamington manager Paul Holleran said their Birmingham Senior Cup win had added gloss to what was already a pretty memorable campaign. Nine days on from their Southern League Play-off final win, Brakes beat a young Wolverhampton Wanderers side on penalties at Molineux to lift the Birmingham Senior Cup for the first time in 45 years. Tony Breeden proved the Leamington hero, scoring one and saving one in the shootout and Holleran said the dramatic finale was a fitting end to their promotion campaign. “It was a great occasion and a great way to end the season,” said Holleran, who was celebrating his 400th game in charge of the club. “It’s a fantastic stadium and Wolverhampton Wanderers went out of their way to be hospitable to us. “The Birmingham FA made it feel like a cup final and now all of a sudden in the space of three weeks we have three trophies. “After three tough years, it’s reward for everyone who stuck at it, those who work hard at Leamington and put the graft in. 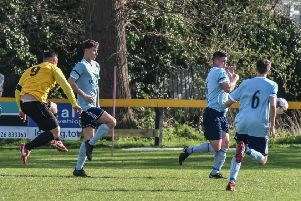 Breeden’s save from Andrew Sealy settled the tie after Brakes had scored all five of their spot-kicks and having seen Rob Thompson-Brown also find the net from 12 yards in normal time, Holleran was confident his side would prevail. “We’ve got some good penalty takers. We got off to a good start with Tony and Robbie (in the shootout). With Tony’s penalty I don’t think three keepers would have got to it. And after enjoying the occasion with a backing of close to 800 from Leamington, the contrast with their tame FA Cup defeat to Highgate and home humbling by Slough was not lost on Holleran. “Highgate and Slough at home are now a distant memory but it’s those games that help make a season and we responded well.